Published by Cyril Huze November 28th, 2015	in Customs and Wheels. THE SPORTEC™ Klassik. If you’re looking for a ‘new’ great handling and performing tire for your 80s restoration project look right here. Newly launched in 2015, the SPORTEC™ Klassik tire introduces fantastic cornering with great line stability and feedback for the riders. Available only in metric sizes, the tire features a tread pattern loosely based on the ME22, now with modern compounds and materials. THE LASERTEC™. It has a classic look plus proven technology, with excellent handling, improved feel, effective water evacuation and balanced riding behavior thanks to METZELER’s “Multiple Radius Contour Design” of the carcass and tread pattern. The high silica content provides excellent adhesion and braking stability. The LASERTEC™ size range offers riders of bikes with bias ply tires from the 70s even to the 90s the perfect blend of performance and mileage. 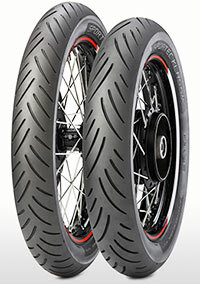 The Perfect ME 11 Front is a great METZELER tire option for restoration projects. It features a classic rib front tread pattern that was the norm in the 60s and 70s and is popular again. This tire offers reliable cornering with great straight line stability and easy handling. Available in a tubeless design and can be used with a METZELER tube on a tube type rim. This Perfect ME 11 can be matched up with either a Perfect ME 77 or Block C rear tire. The Block C. If you need the perfect tire from the 60s, look at the METZELER Block C tires, featuring the traditional METZELER pattern but built with more modern compounds and methods. As in the past, the tire is bi-directional and can be used in a front or rear application. It is available in a tube type construction only and must be used with a METZELER tube on a tube type or tubeless rim. The size range allows vintage bikes like 60 Sportsters, 60 &70 Japanese and English bikes, and of course the famous BMW “slash” series bikes to have that “look” from long ago. The Perfect ME 77. A METZELER staple for many years, the Perfect ME 77 has the famous METZELER vintage ‘look’ and is available in rear sizes only. These rears can be matched with a LASERTEC™ or Perfect ME 11 front tire, and offer great wet weather performance and easy handling. Available in a tubeless design and can be used with a METZELER tube on a tube type rim. The perfect fit and look for a KZ900 or a CB750 restoration project, for example. 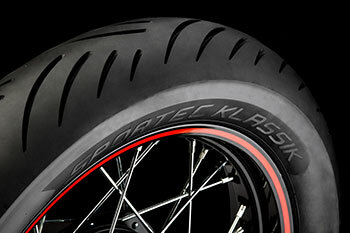 The Block K. METZELER’s special tire for classic motorcycles with a sidecar. This tire features a flat profile with a classic tread pattern to help improve the handling of a three tired sidecar rig. The tire comes in a tube type design so a METZELER tube needs to be installed when in use.